"This is an easy to make recipe. I've tried numerous others using colas, fancy pans, etc., but none come out near as good as this. Keeping it simple is the best way. Be sure to use a high-quality charcoal, so that it will burn for a long time. 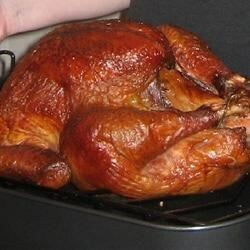 Turkey will be moist tender and smoky!" Place turkey onto the prepared grate. Add 2 handfuls damp chips at start of cooking, then a handful every couple of hours during the cooking process. Leave the lid on - DO NOT keep looking at the turkey, or you will let the heat out! Continue smoking until the internal temperature of the turkey reaches 165 degrees F (74 degrees C), or keep going until the coals die out. My dad has made turkey this way for years. It really is simple and easy to do.